It seems like an age seems I played a WiA PBEM. But returning to WiA feels like slipping in a very comfy jacket, such an elegant game design and full of scenarios that provide fascinating tussles. 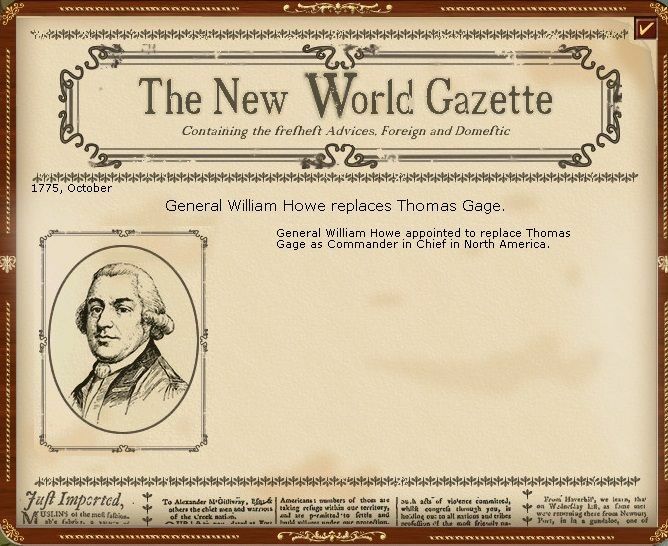 This is going to be the long (potentially) American Revolution scenario starting in 1775. 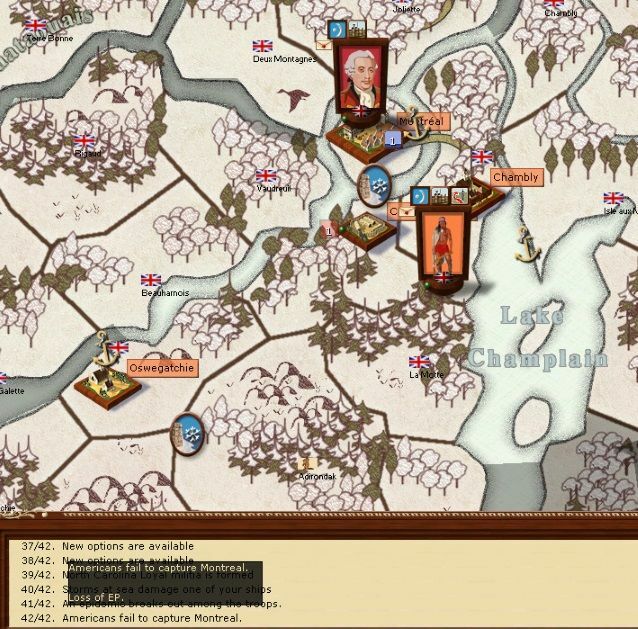 Vigabrand, my opponent, has taken the tax evading Americans and I have the evil imperialist English (with additional Scots, Irish, Welsh and a horde of Germans) . We've played a few PBEMs against each other (incl RoP and CW2 and have a current WiTE PBEM – which you can read about here if you want). I've played this scenario once, a while back vs Narwhal. Not only did I receive my traditional beating at his hands, but I also managed to skillfully starve the British army to death. So plan (a) is not to do what I did in that game. Plan (b) is to have a good look at the map before starting. "A clash of cultures. On one side they believe that tea should be made with a mix of boiling water and milk, drowned in sugar and turned a strange orange colour. On the other, tea is made with room temperature water and the tea bag carefully placed in the same room as the cup for no more than 15 seconds. Who ever wins ... humanity loses (or needs to do the sensible thing and start drinking coffee)". As is traditional in a WiA AAR, there may be a few slurs, inventions, stereotypes and insults. November - you call this winter? So lets start with that map and a very broad overview. In the north, I am now the one invading from Canada. I have a small toe hold at Boston. In the south, I own the deep south, most of the rest is held by the Americans but I have significant loyalty advantages. So I find Sir Guy and his merry men guarding the croissant stores in Quebec. He's off to Montreal on his first step before he conquers New York. Well apart from the problem that he turns into a mound of quivering jelly if he leaves Canada. Ok if Sir Guy is not the man for the job, what about Bill Howe and his huge Boston Army. Indeed, what about it? They are locked for the opening turns in a city that has no depot. So they even refuse to undertake the challenging job of feeding themselves. 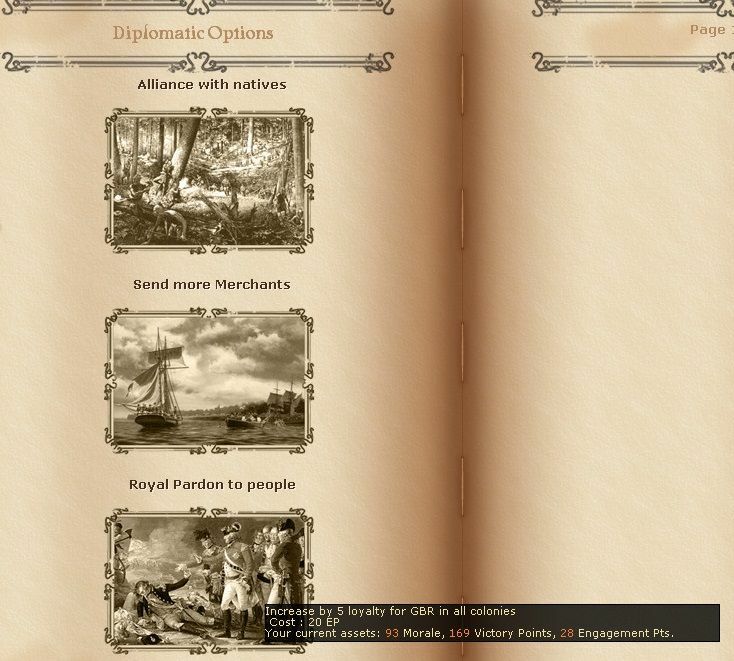 The in game notes set out the rough dynamic of the war. 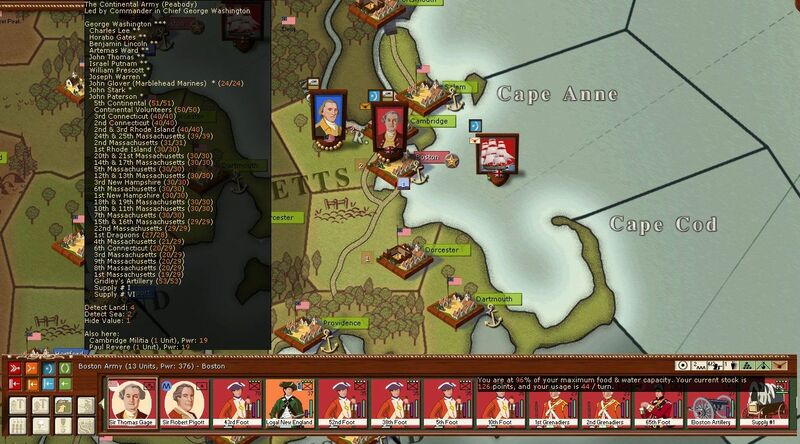 Basically in 1775, the Americans outnumber me, from 1776-9 I have my best chance. After that the war turns against Perfidious Albion, not least as the risk of French intervention arises. As in many AGEOD games, Engagement Points are an important element of currency. Here they can unlock Indians, bring in replacements and unlock other options. Not far from Savannah, which I own, a key objective in any case. As you can see New Orleans is out of my grasp as its Spanish at the moment. That was fun. Defend the croissants at all cost. Or throw them at the enemy if frozen. I was also beaten in this scenario by Narwhal ! Later I've played with other opponent and we have found out how supply is important. 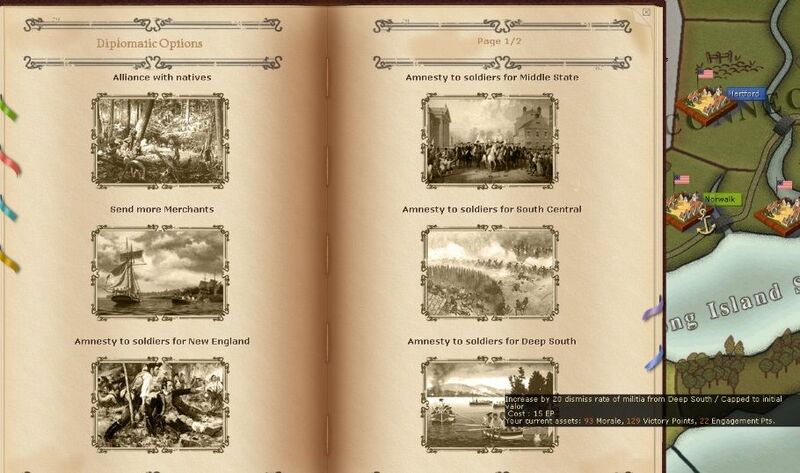 I sense, to know the weakness and strenghts of each faction and for scenario knowledge it is important to play multiple times same scenario in PBEM. Thanks for writing this AAR. Pocus wrote: That was fun. Defend the croissants at all cost. Or throw them at the enemy if frozen. indeed, at all costs I will keep the Americans away from the croissant stocks ... at least till the French decide to join in the war on their side, presumably bringing their own supplies? Baris wrote: I was also beaten in this scenario by Narwhal ! I think we need to create a therapy group for those of us who have been beaten by Narwhal at WiA. 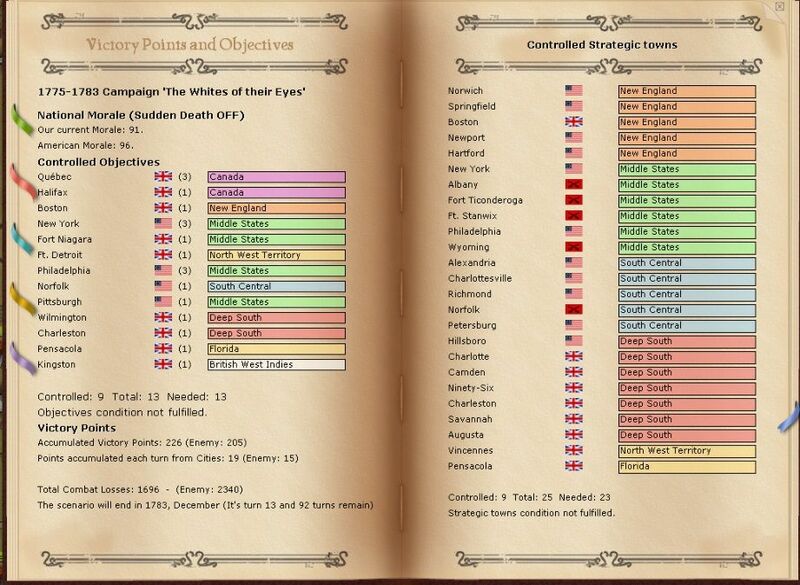 I think the best I ever managed was a draw with the British in the 1812-15 scenario. 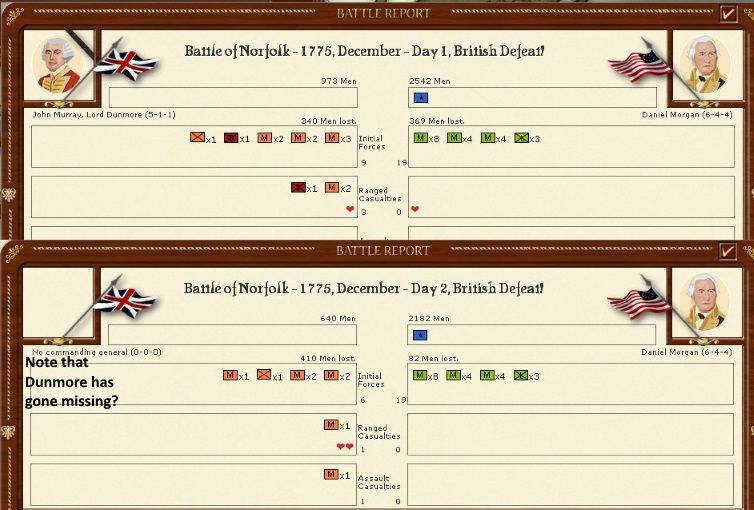 This scenario really captures the problem for the British that a 'small army gets beaten and a large army starves' - certainly against Narwhal I became fixated with New England. I've also since learnt more about how the American reinforcements work and that helps provide a framework for the early years. Main issue in this turn is the mounting supply crisis at Boston. I receive Howe's corps and in theory I could build a depot using its supply train. In truth, I find supply wagons in WiA very hard to replace so I'd rather not use them up too early. Once the Boston army unlocks, I'll break it up. 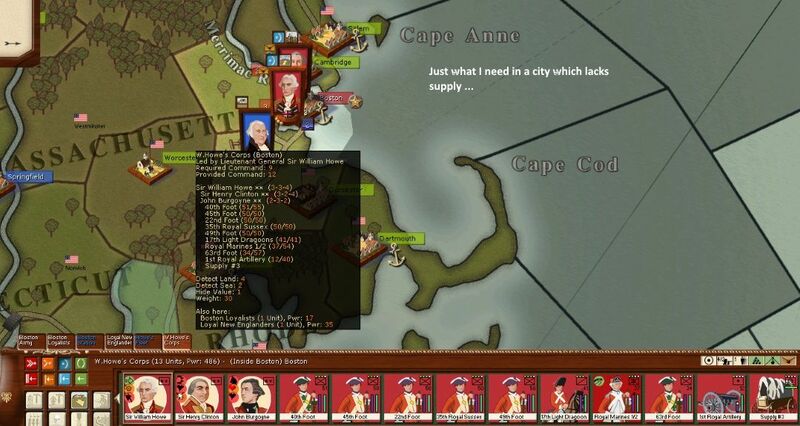 Goal is to leave enough at Boston to hold the city and live within the supply limit (perhaps supplemented by sending the supply wagons to another supply source to refill), but be able to deter any direct attack. For the moment, if I can, grabbing control of the Deep South is my first goal. The reason for this is the way American reinforcements are gained. 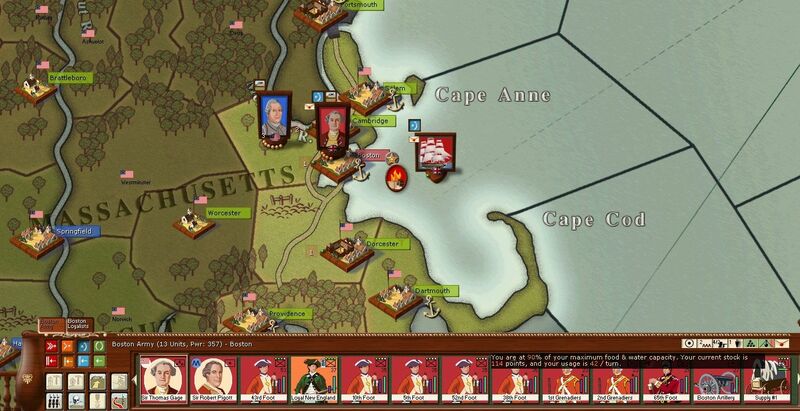 The revolting colonies are split into 4 regions - New England, Middle States/Colonies, Middle South and Deep South. 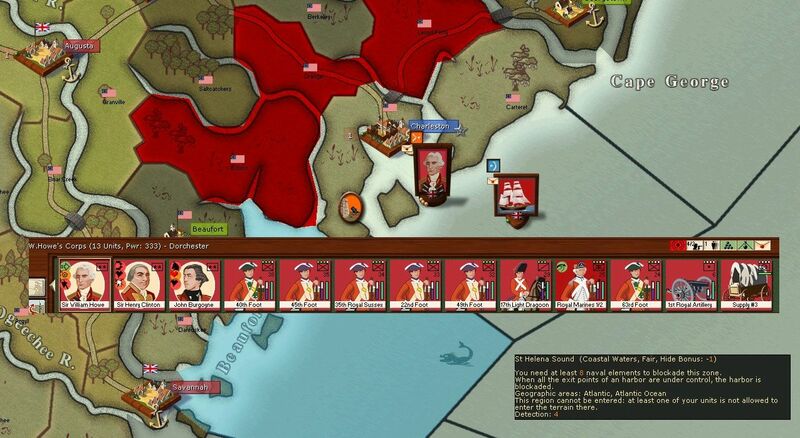 If I have no presence, then the Americans gain continentals but not many militia. 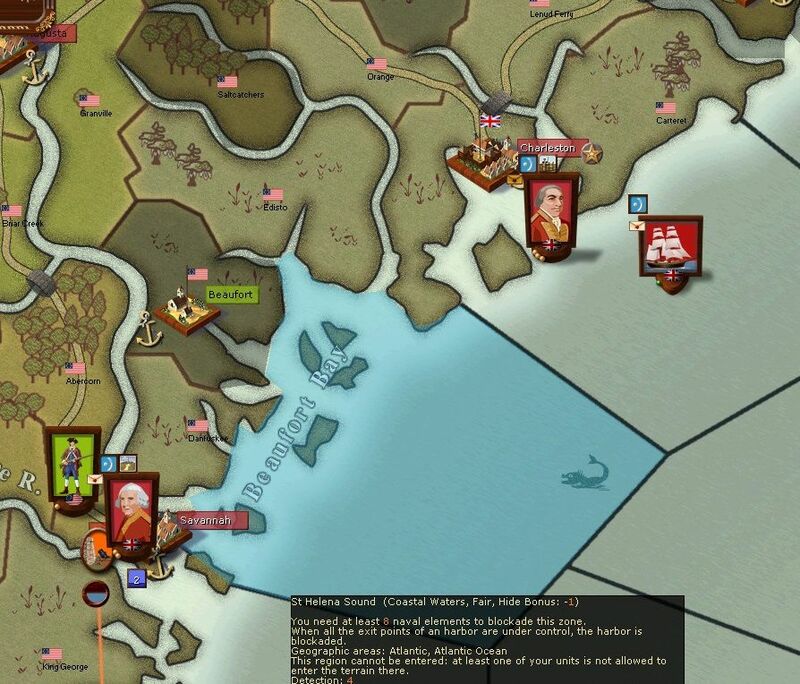 Oddly not decisive as the American regulars really can't stand up to mine in open battle. 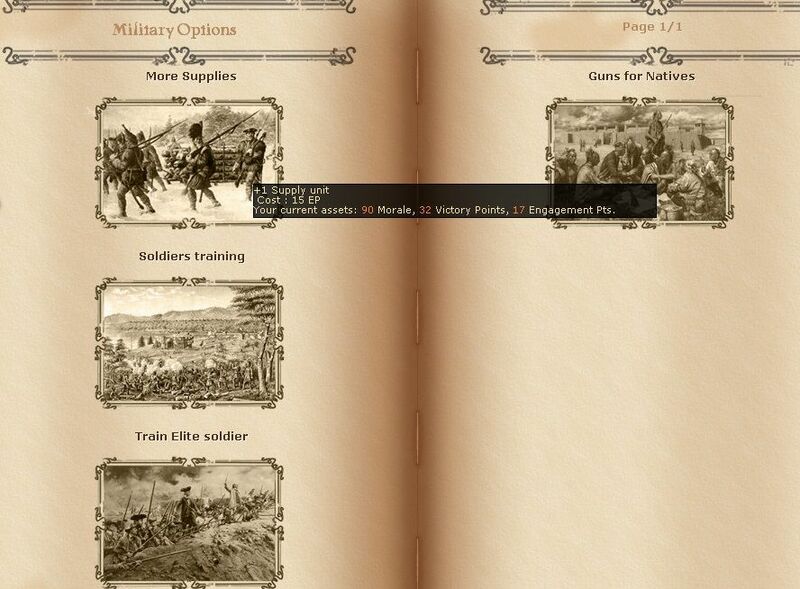 As I take more cities, the number of continentals drops but the number of militia increases (up to a point, when my control starts to reduce both). Finally if I control all seven cities there are no levies of either type. 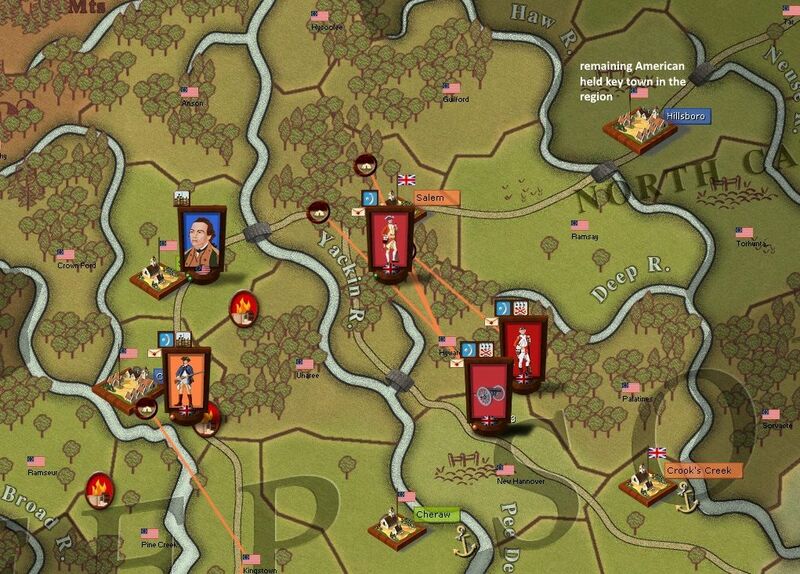 My plan is to try and have control of the Deep South by January 1776. I can then think of where to campaign from 1776-1777. Elsewhere, not much happens. I'm planning to unlock a number of fixed Indian bands over the summer but don't want to leave Montreal too exposed. So juggling the lake fleet and working out what units I need to move. Of more importance, Howe has arrived at Charleston and will attack next turn. On the lakes, I'm reinforcing both Oswego and Niagara. This will help hold them as useful jumping off points for next year and enable me to start unlocking all those nice friendly Indians. 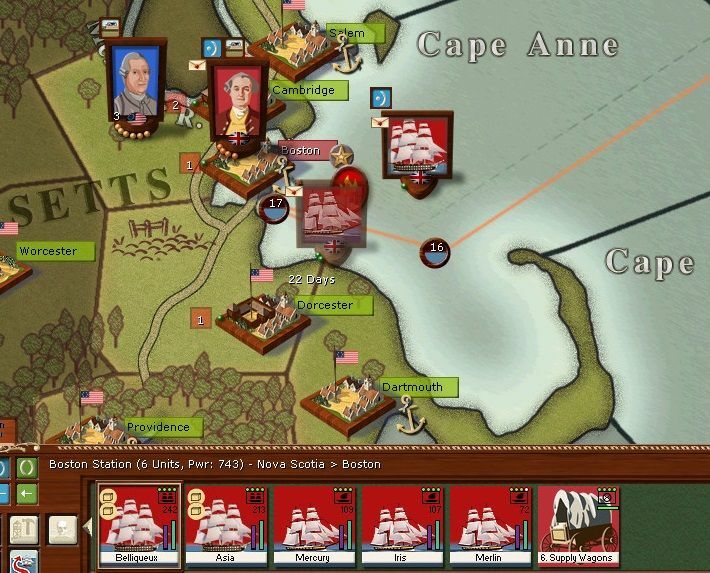 At Boston, I split off about 40% of the army and they head south to reinforce Savannah where they will meet some units from the Caribbean. Spend some of the EP I've built up on additional supply wagons. Here's the VP situation. As in the last post, my goal is to try and dominate particular regions so as to cut down on American replacements/militia. 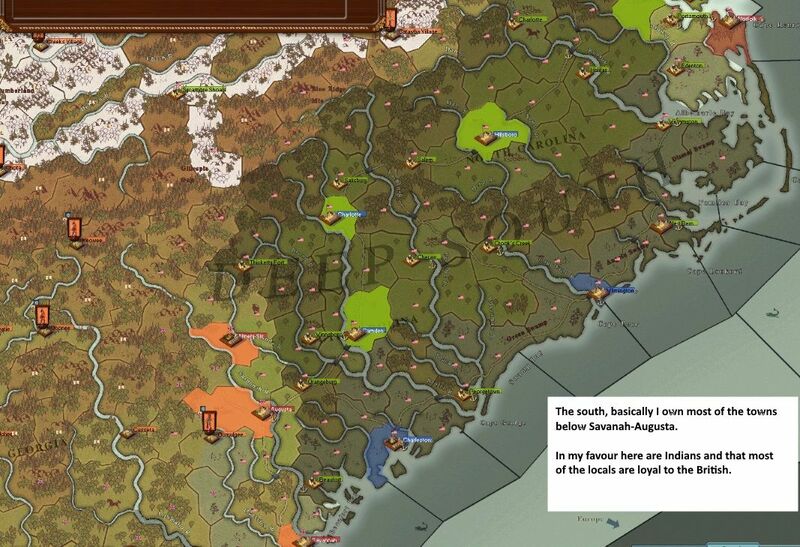 Charleston should fall next turn and I'll try and grab the inland cities in the Deep South by the end of the year. Vigabrand has clearly not deployed any regulars to New York so its showing as unowned as it is essentially pro-British. Also so far, we have had no fighting. That message has a clear mistake ... since they held their 'congress' in a field outside Savannah while my troops demonstrated how to make tea the English way to the bemused locals. 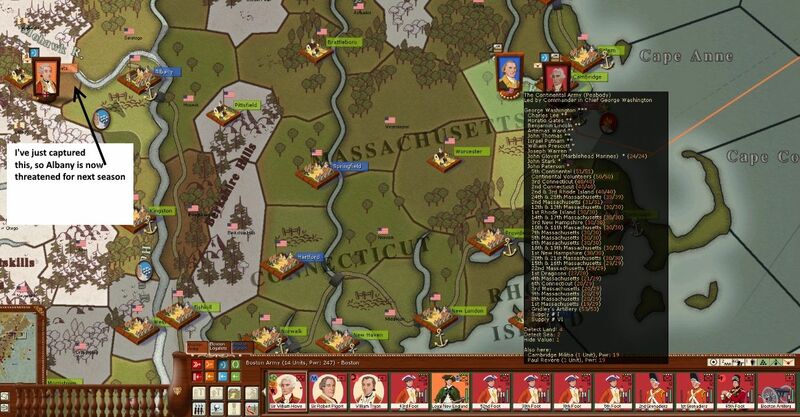 Up north, things remain problematic, the army in Boston still will not actually do anything about feeding itself. 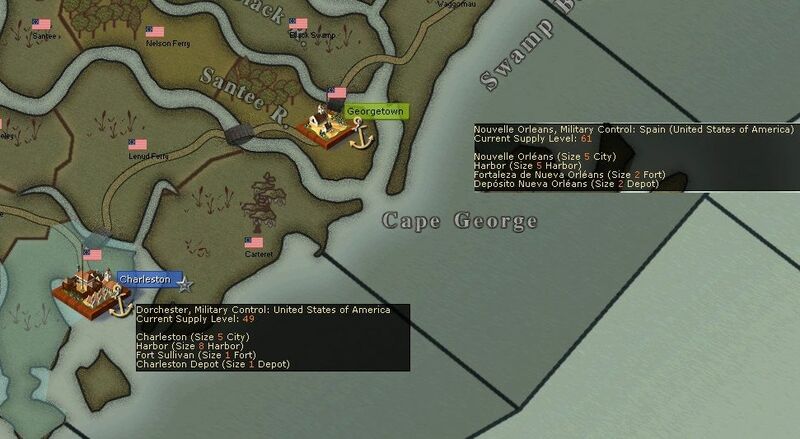 Anyway to celebrate the victory at Charleston, Burgoyne is sent to capture Camden (another reinforcement town for the Americans), while some of the army in Savannah is ordered to stop the Americans 'having congresses' in the field and to move onto Augusta. 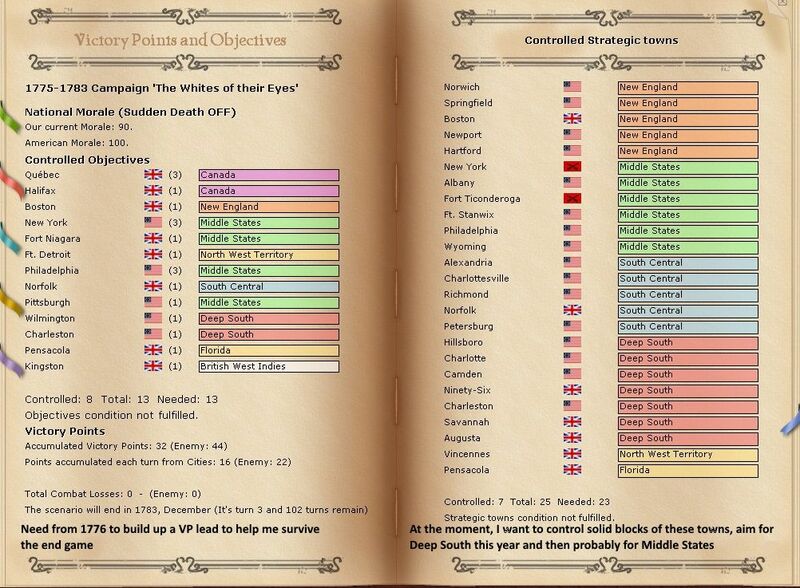 Very interesting keep it going - how do I know which cities spawn Amerisan reinforcements? How do i know which ones produce extra EPs? 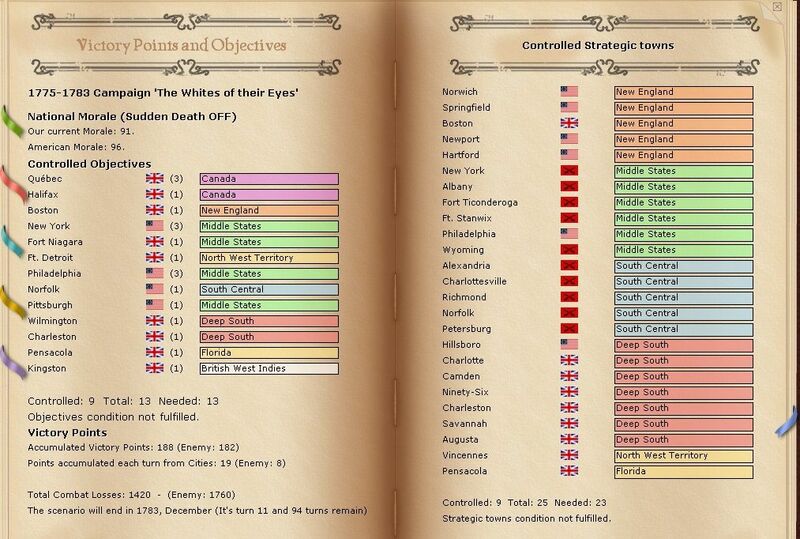 steelwarrior77 wrote: Very interesting keep it going - how do I know which cities spawn Amerisan reinforcements? How do i know which ones produce extra EPs? as you can see there are 5 clusters (but you can really ignore the bottom two). 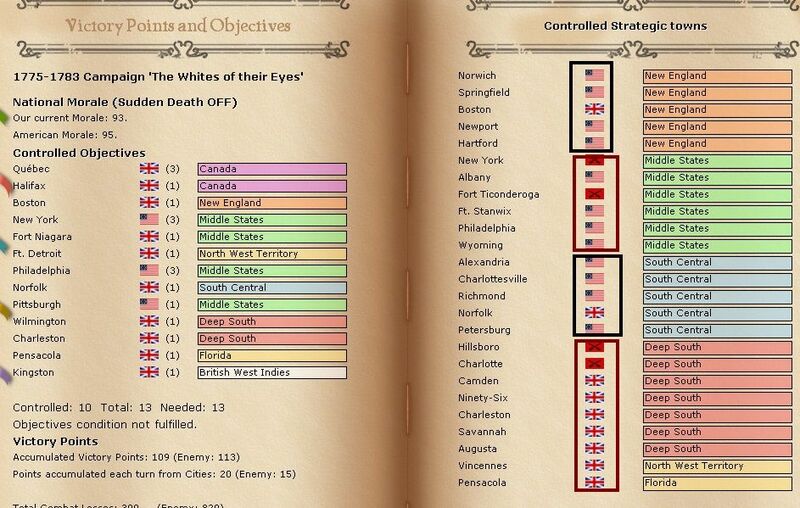 Basically if the British control none then the Americans get continentals but no/few militia. The range 1-3 is probably the worst for this as they gain both militia and continentals. Once you are over 3 you start to squeeze out the continentals. If you hold all then they are no reinforcements. For this purpose a contested town (the red marker) counts as American. 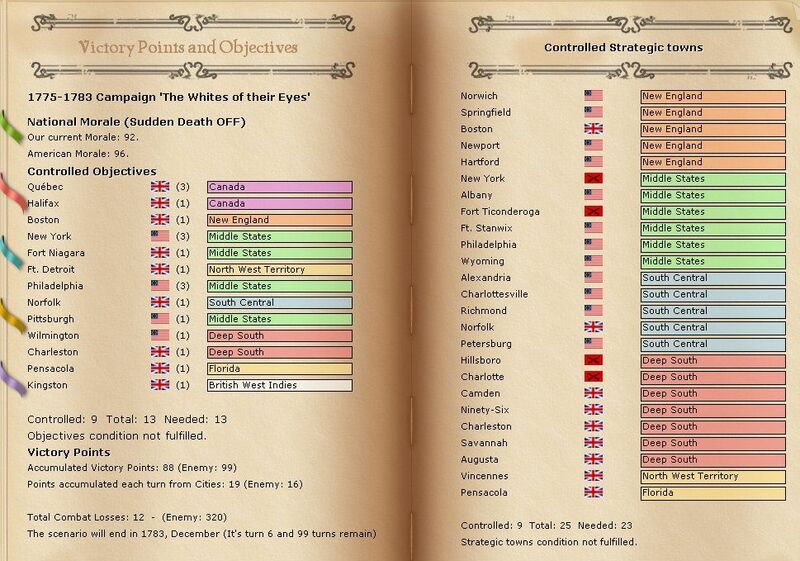 In our game those are all actually held by the Americans but I have some loyalty there. If vigabrand had a regular battalion in the province it would show as US controlled. 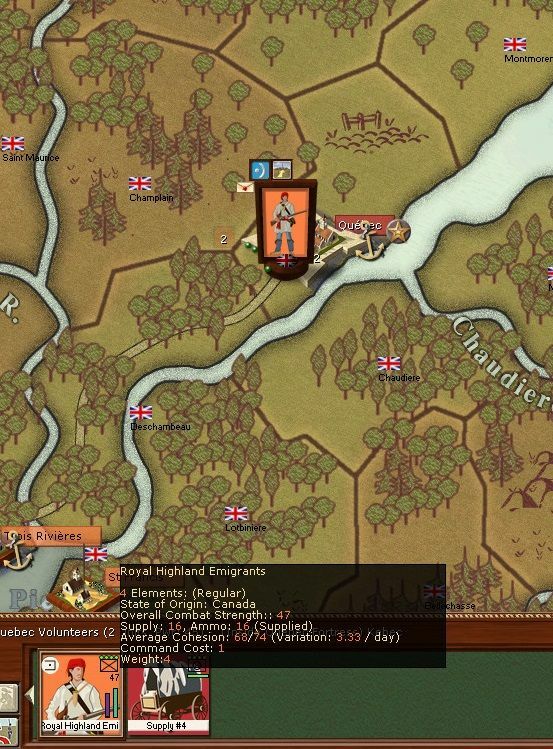 So for the most part with the British you need to leave regular battalions or you do not gain for ownership - so there is a danger of dispersing your army into small garrisons. The solution is to raise loyalty and you have commanders with the 'hated occupier' trait. 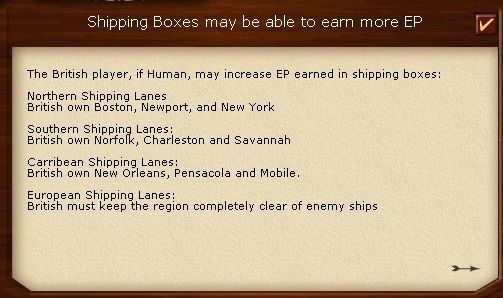 These will over time increase your loyalty so you could then just leave say militia to hold the town. 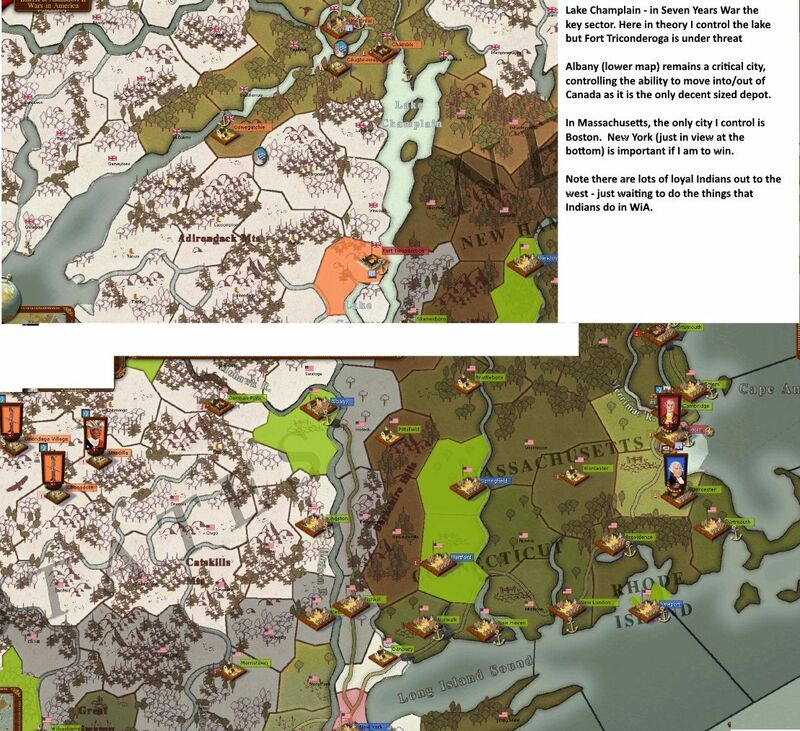 So basically there are three clusters of three cities, the southern group are doable early game (and 10-12 extra EP is more replacements or supply wagons), you can sometimes grab the New York group by 1777 (but are unlikely to hold them all that long). Not that much dramatic happened in this turn. Also they are keeping a huge American army pinned down. In the south, I'm trying to grab Hillsboro and Charlotte before January (when the next US reinforcement cycle hits). In practical terms I have 2 groups of regulars facing off against 1 US organised formation. So its a case of movement, trying to secure my gains (each needs a garrison) and being cautious. I suspect I'm not going to make it in time. But then winter in the south is not the complete cessation of all military action that it imposes on the north. Few points about my understanding of the longer term. I need to be well ahead on VP by 1777 as after that the war turns against me (France stabs Perfidious Albion in the back). Although I am in theory only 4 cities from 'victory' and I'll take Wilmington next turn the reality is that is not practical. Pittsburgh is hard to reach and Philadelphia is easy to defend (New York less so). 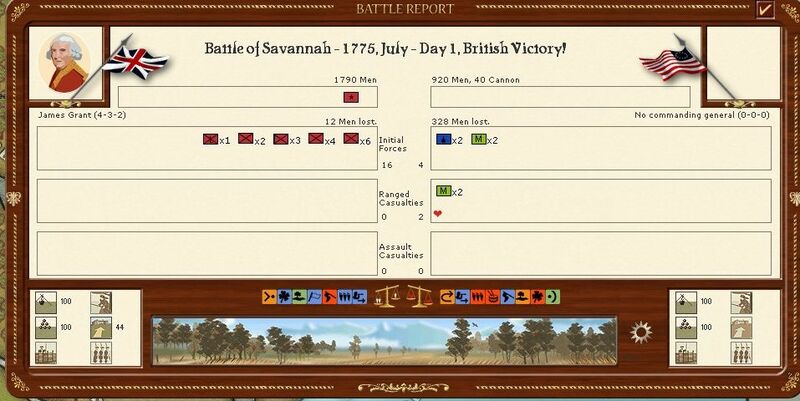 So its a case of thinking about how to use the large 1776 reinforcements I gain. By summer of 1776 I hope to have the Deep South under control, geographically South Central would then make sense. But the Middle States are vulnerable to an offensive both from Canada and the Eastern Coast. 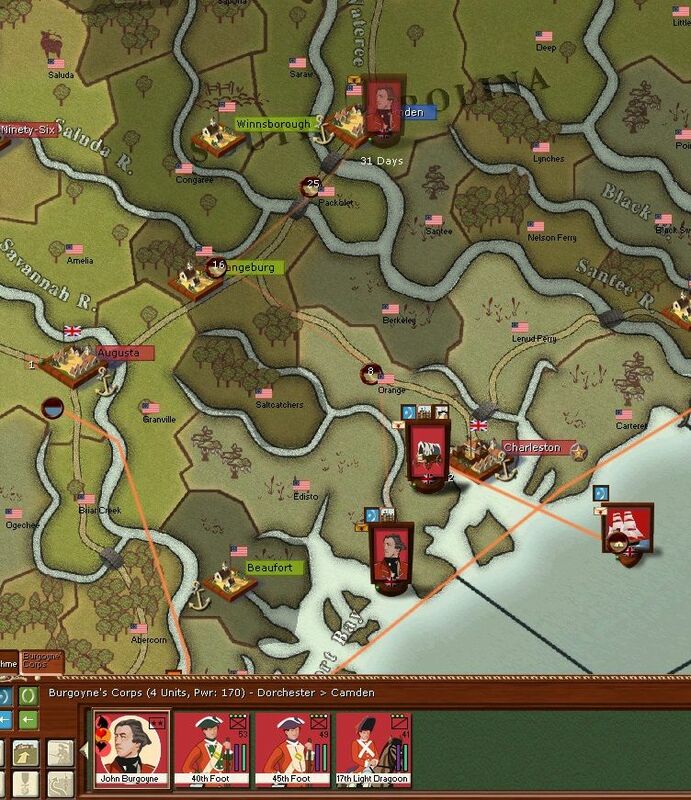 Quite a busy set of battle reports as I make some more gains in the south. Campbell seems to have the only organised US formation in the south. In the south, I am less worried about winter than in New England and on the Canadian border. So the newly arrived Howe is ordered to advance towards Crook's Creek and thus threaten the US reinforcement cities. 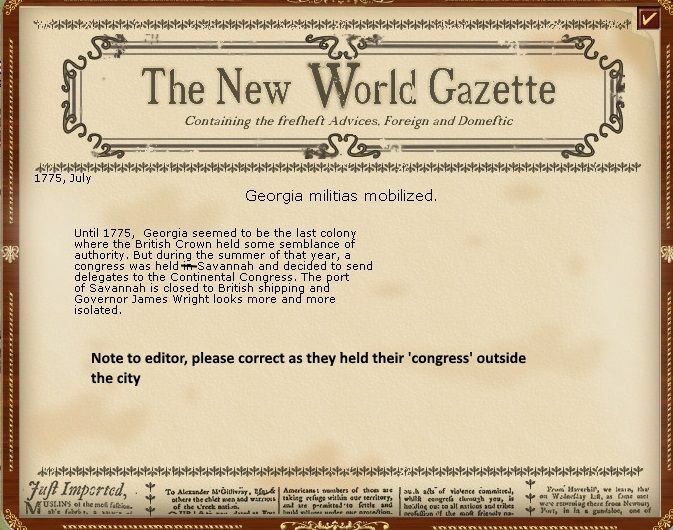 I doubt I am going to take them all by January 1776 but hope to have the Deep South under control by next June. Great AAR loki100! What is your plan in regards to the Boston area in the future? Will you continue to hold your position? Abandon the city? Or perhaps launch an offensive of some kind? good questions to which I have no real answer. c) if Vigabrand does risk an attack and wins (admittedly unlikely), I will lose an awful lot of troops. 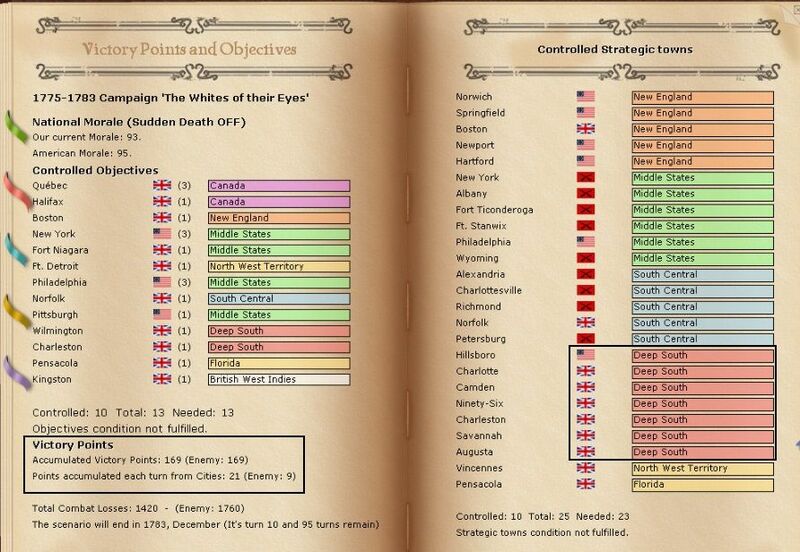 Most of my previous experience with WiA has been in scenarios where the American-Canadian border is the key area – War of 1812, French and Indian Wars etc. In those, by October at the latest you make sure that all your armies are safely tucked up for winter. So its a bit of a surprise to realise that while winter brings problems (slower movement etc), its not the complete end to all operations that it is in other games. Which is a long way of saying there was quite a lot of action. 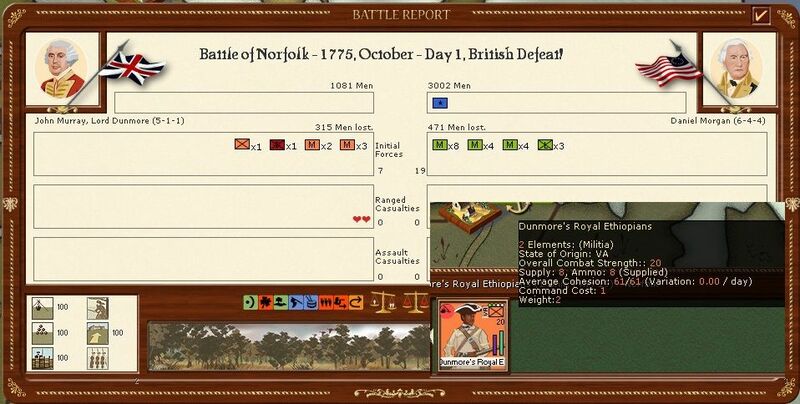 Despite being beaten Dunsmore bravely hangs onto Norfolk and has some useful reinforcements. 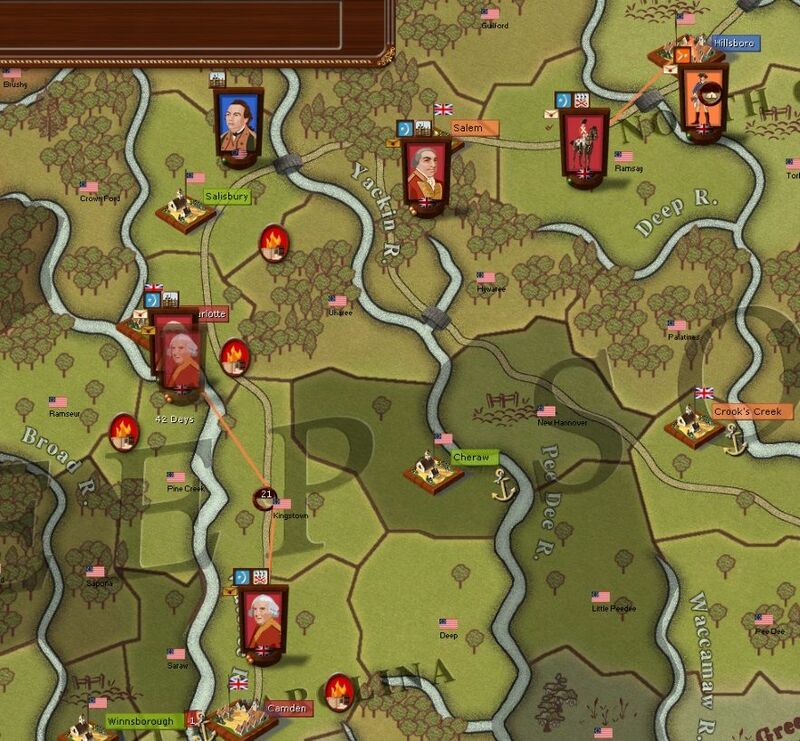 But Caldwell grabs Fort Dayton, isolating Fort Stanwix – I picked this as it is not an objective city so this gives me a useful gain but does nothing to trigger additional American reinforcements. In the south, James Hampton arrives in Augusta. My goal is to try and raise loyalty to my side and thus allow me to stop leaving battalion sized garrisons everywhere. Well even despite the better weather, not much happened in the south in December. 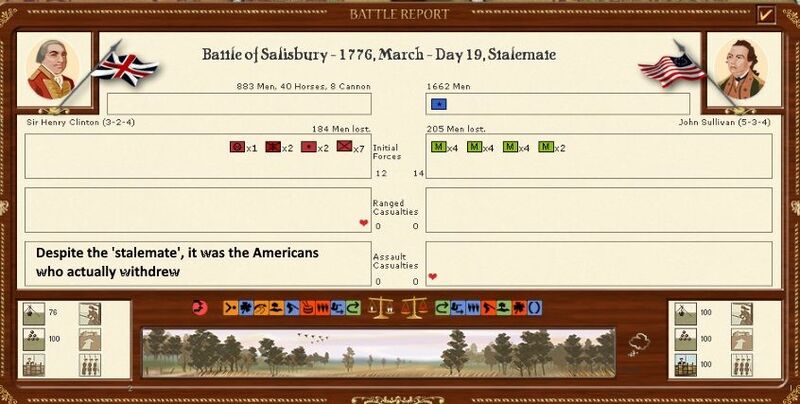 The one remaining US formation beat up some of my militia. But 1776 brought far more action. Here's the position in the south. I'm basically trying to cut off that American unit. If I can force it out of supply then I have complete military control of the region. That will also give me control over Hillsboro. Bit of a disaster at Norfolk as the rescue boats arrived too late. Even worse, the Americans celebrate by drinking some weak tea. This all proves to be too much for Dunmore. Canada celebrates when it becomes clear the Americans have not invaded. I decide to celebrate by allowing the Americans to be loyal again. I failed to hold all the key cities in the Deep South but that should limit the Americans to just a few militia replacements. 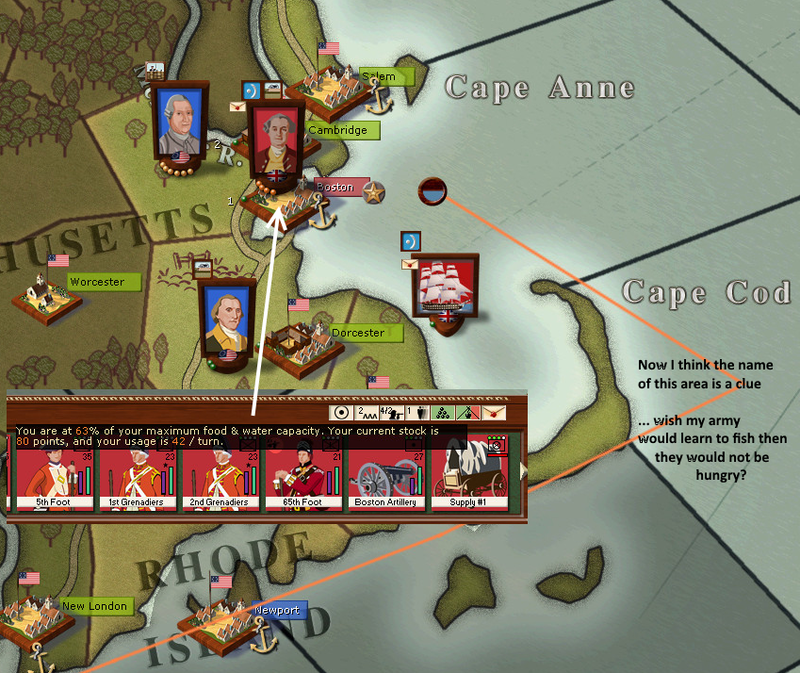 By the end of 1776 I really need a decent VP lead to cope with the steady losses in the later years. Not that much happened this turn. 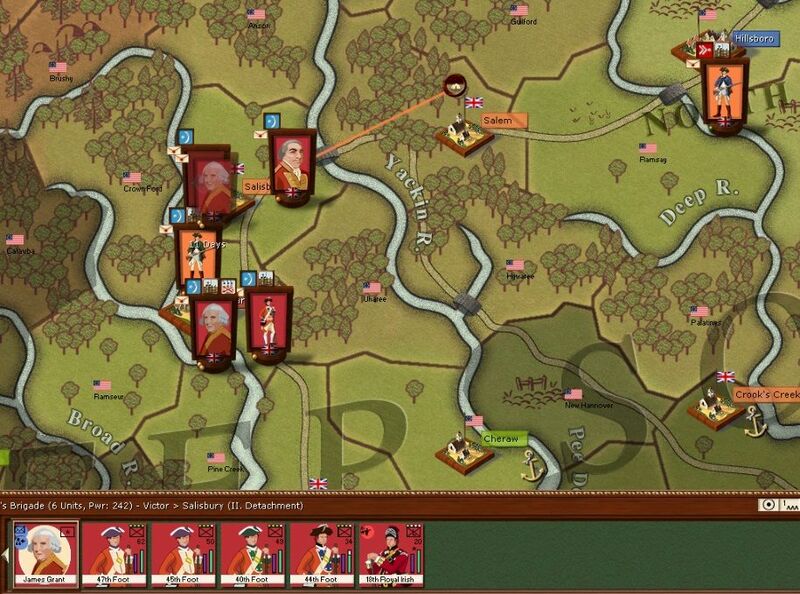 In the south I now have that US brigade pinned into a small area. Hillsboro is under siege but won't fall till I can spare some regulars. Situation at Boston remains a problem. Supply is ok but not enough to allow the army to recover. The only reason to hold on is that is attracting the attention of the Continental Army. I send some transports in case I decide to pull back. The other option is to move the army into the town. But this invites an easy to maintain siege and does nothing to help with the supply situation. I have substantial reinforcements due to arrive by the spring and early summer. I'll have Hillsboro by then (the American reinforcements are triggered in January and June). I think I can create a small force to make progress in the South-Central area but my (and probably obvious) target is going to be the Middle States. WiA provides two supply problems. First there is no mechanism to push supply from where it is produced to where it is needed. Second, there are few large supply producing cities (hence my Boston problem). This matters as replacements are free in WiA as long as some of the element is intact and the force is in perfect supply. So any supply lack, no matter how minimal, keeps your army weak. Going for the Middle States has the advantage that I can take control of some of the main supply producing cities. This is going to be my focus in 1776 more than trying to limit American reinforcements. I'm going to gamble on Philadelphia as the prime target. It has a large depot (so can be used to bring my larger armies back to full strength) and effectively cuts America into two. From there I can concentrate on capturing South-Central. The Canadian reinforcements are going to be used to take out the objectives along the Mohawk (Triconderoga, Ft Stanwix and Albany). So why exactly is Boston such a supply problem? If you were to enter the city would you be in good supply compared to being outside of the city? Does it matter as far as supply goes? Field Marshal Hotzendorf wrote: So why exactly is Boston such a supply problem? If you were to enter the city would you be in good supply compared to being outside of the city? Does it matter as far as supply goes? The problem in WiA is it captures the small size of most North American cities up the end of the war of independence - its notable that it is less of a problem in the War of 1812. Add on to this there are very few depots as the British didn't really envisage having to supply large armies in the region. 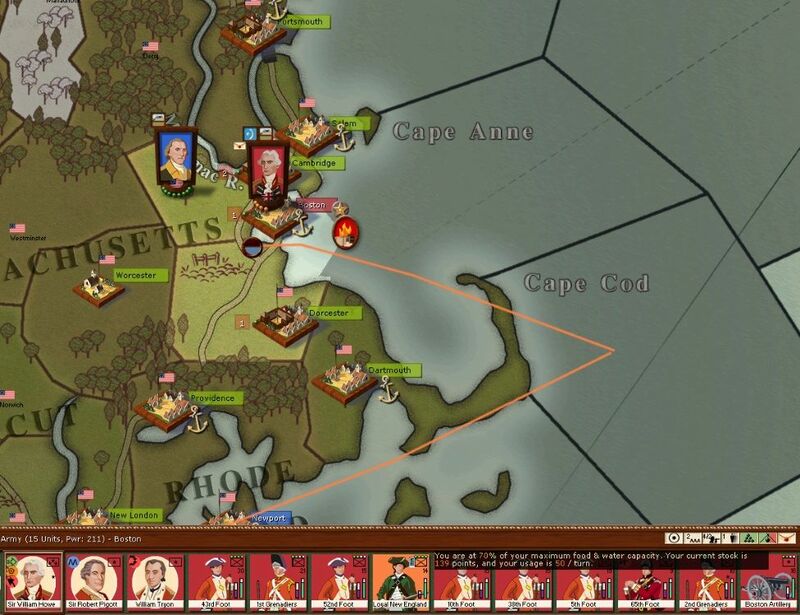 So Boston, although relatively large, produces about 10 supply per turn. 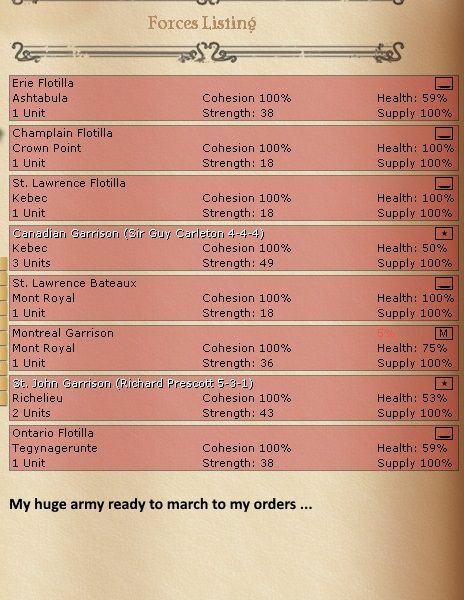 Even my relatively small army uses 50. Now I can keep things stable by shuttling in supply wagons but its hard to build up a stockpile. 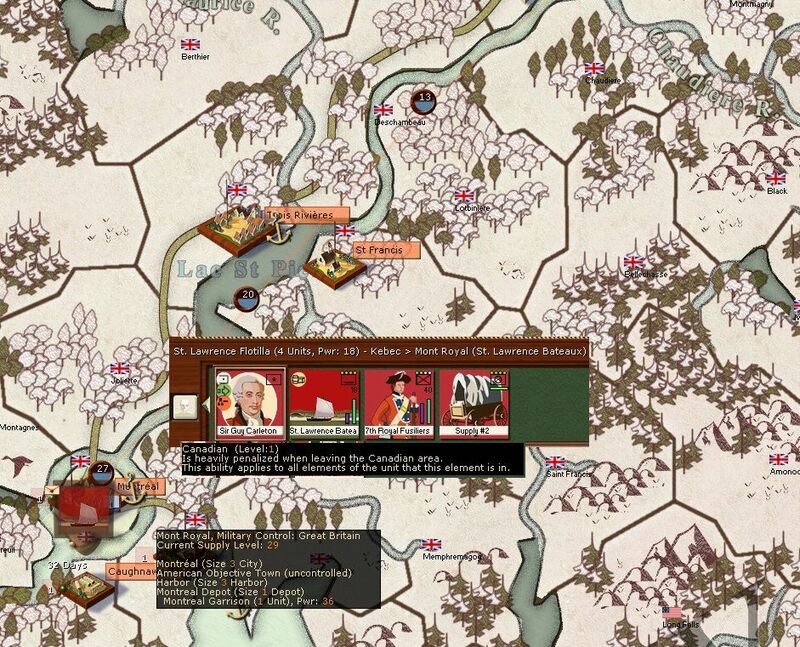 The result in general is a need to disperse your army at the end of the campaign season so that hopefully each block is in supply - but of course this risks being defeated piecemeal if your opponent stays in a large army - its a nice (ie horrible) dilemna. If I retreated into Boston I get some supply but not all the 10. Now its possible I could deter an attack with a smaller force if I was in the city so there is again a trade off. I'm not sure what the right answer is. This is only my second go at the big campaign. Last time I completely missed the importance of limited supply and Narwhal pretty much had my forces wiped out by the end of 1777 .... if I recall the final act was a desparate attempt to seize New York. An alternative is to give up Boston, retreat to Newfoundland (where there is a depot) and attack again the next season. Given what is going to happen (spoiler alert), I'm now thinking that might be the best solution? Well for everyone but Francis Smith. 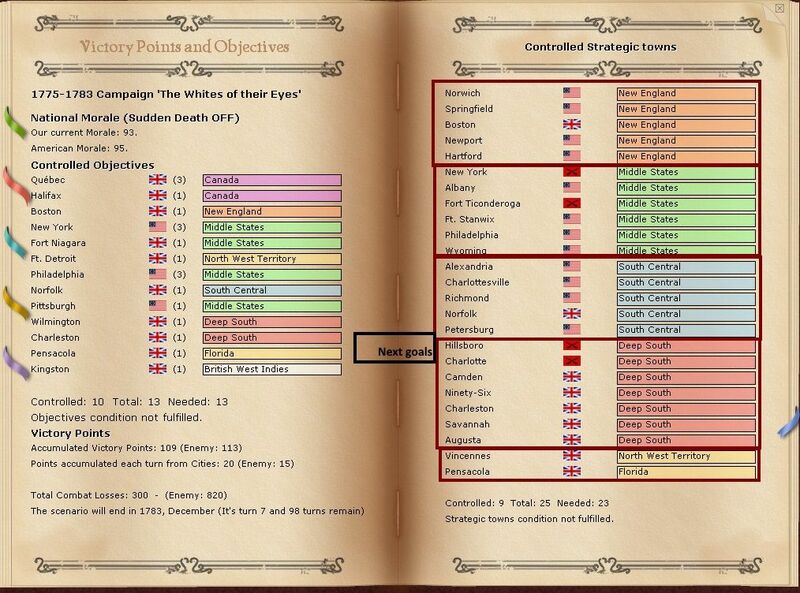 Does seem as if the Americans are keen to shoot the British aristocracy. In the meantime the stand off at Boston carries on. Unfortunately my army has just had an epidemic. Clearly they have not been boiling their tea properly. loki100 wrote: The problem in WiA is it captures the small size of most North American cities up the end of the war of independence - its notable that it is less of a problem in the War of 1812. Add on to this there are very few depots as the British didn't really envisage having to supply large armies in the region. So Boston, although relatively large, produces about 10 supply per turn. Even my relatively small army uses 50. Now I can keep things stable by shuttling in supply wagons but its hard to build up a stockpile. I see now. Thank you sir. Thank you for taking the time to document your game. Good reads. WiA is an incredible game. Sadly, I have yet to play a human in this scenario. 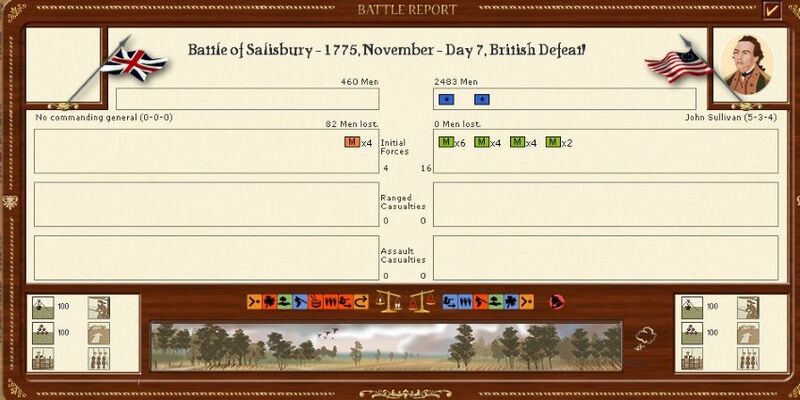 Though I did recently have a match against a human in the Seven Years War... And you are right, after not playing this game for many years it was very easy to get back into. 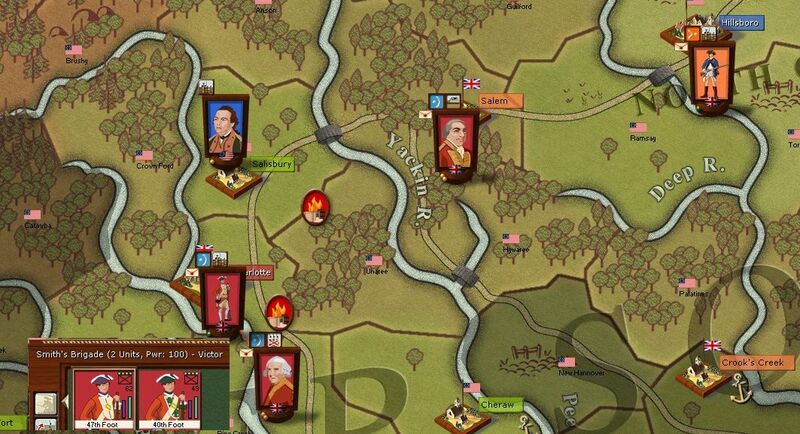 Looks like Washington is packing some serious heat in that last screenshot. I wouldn't fear... I'd take inspiration from a Scotsman that once chastised Big G. Here. Agreed, thanks for the AAR Loki. 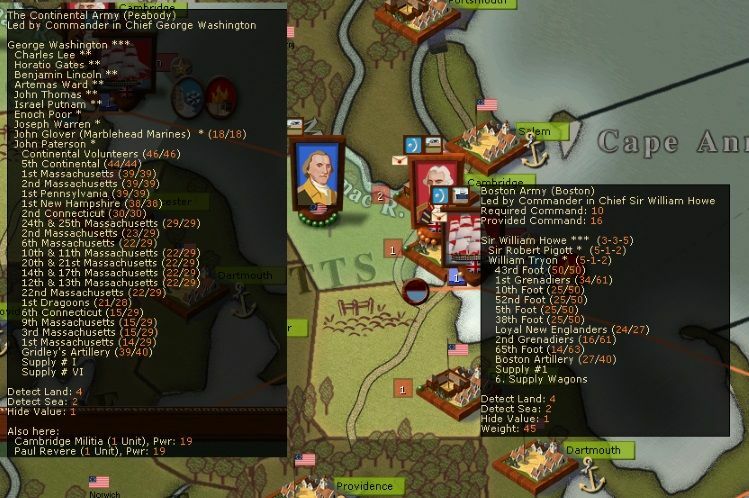 When I played solo in this scenario recently Washington split his forces, I got to break out, capture him and the depot. It was like a gift from the gods to resolve the Boston situation. I don't envy you having a human opponent who knows to keep all those bright green dots together right on your doorstep. Cardinal Ape wrote: Thank you for taking the time to document your game. Good reads. Kizig wrote: Agreed, thanks for the AAR Loki. Not that much happened in this turn. In the south, I'm trying to harass that American formation, trying to stop it regaining supplies and cohesion. My intention now is to secure Hillsboro. Its the last US reinforcement producing town in the region and their next round of reinforcements are due in June. At the same time I'm leaving fairly strong garrisons so I don't lose anything I have recently captured. Not much change in the overall situation since the start of the year. My small VP advantage is relatively meaningless in the context of the overall campaign.